I would also like to say thanks to all of the team at Caboolture roofing for tiling our new roof on our new addition to our home. You guys carried out the job quickly and professionally and left the site tidy. If we need a roof tiled again, we will give you guys a call. Once again I thank you for your professional an efficient service. In my 5 plus years in Real estate I have been able to rely on Caboolture Roofing Services to save many contracts of sale from crashing. After a roofing issue is identified in a building inspection report many purchasers will consider pulling out of a contract due to roof repairs being required sometimes time is limited before a property settles. With a call to Chris & John I can always be assured they can attend to a job sometimes even on the day of the request ensuring the buyer is happy to proceed with the sale. They have always gone above and beyond my expectations and I would happily recommend there friendly service to any client. I have worked with a lot of contractors over the years and I would rate my experience with you all as one of the BEST!. We would also like to say how much we have appreciated your prompt and efficient service which came with respect and good humor among the crew who worked so diligently the entire time they were here. I am anticipating that the leaks have been repaired successfully as it has been totally inspected by ‘the boss’ and your thorough investigation has been reassuring for us. I will be happy to recommend your service to anyone needing roof repairs and will certainly contact you if further work is needed in the future. Like all of us, I have read and benefited from many honest reviews and testimonials but have never been inspired to write one. Caboolture Roofing Service changed that. From my first meeting with Christine and John, to the completion of the scheduled works, I found them to be experienced, organised and professional. I accompanied John on to the roof to discuss a significant valley problem causing water ingress. John readily identified the cause and what he would do to remedy it. He uses simple terms and outlined the scope of the works and the costs involved. I believe the price was very competitive and accepted. Leading up to their attendance, Christine maintained excellent communication during a period of poor weather to make the final arrangements. Again John attended with his team and over viewed the process to completion. I personally inspected the work and found it to be of high quality. John also offered to write a report detailing his findings to assist in a roofing warranty claim. Thank you to Caboolture Roofing Service for restoring my faith and trust in trades people. Please pass my thanks on to John and the crew for the great service provided. It is great to get a quote, get the job done on time and with a follow up to confirm that the work was done as per the quote. 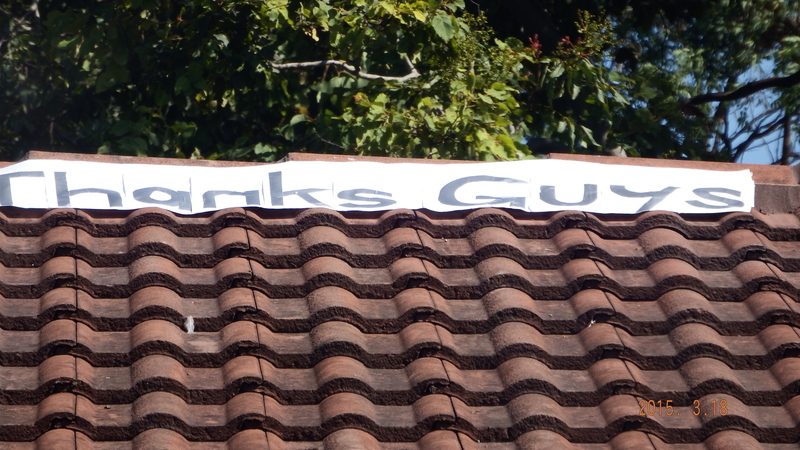 Many thanks for your prompt and excellent repairs to our roof. We are more than impressed by every aspect of the work, from punctuality of arrival to the way in which everything was tidied up with not a trace of leftovers or mess. While we hope we never need your services again (we said that last time!) we wouldn’t hesitate to call on them should we ever need repairs in the future. Just thanking you for your prompt attention and courtesy shown for the repair of my ridge tile. Really impressed with your service and the two gents who actually did the repair, thank you very much. Service such as this rarely exists and a welcomed treat when it does. I can thoroughly recommend Caboolture Roofing Service to anyone. If you need your tiled roof repaired please see John and Christine Bird and their very good team. They have done a great job on our roof. We would like to thank you for your efforts on our behalf to get the roof leak free! …… Again, thank you for your help – your tradies were great – prompt, and certainly worked hard. We can’t thank you enough for your understanding, so thankyou very much for your wonderful and prompt service throughout the last couple of weeks. There haven’t been too many tradesmpeople that we could or would recommend, but you guys are top on our list. Thankyou so much for your care and attention to detail. I do appreciate the way you take care of business and also of people. Thankyou for your prompt and courteous service. Your boys also did a good job in cleaning all the rubbish and left my garden as they found it. Thanks for a job well done. I wish to thank you for excellent service and professional business manner over and above today’s practices!! How to identify which tile is on my roof?